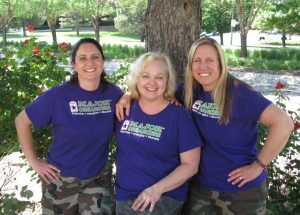 This team of professional organizers serves the greater Colorado Springs area from Fountain to Monument. Appearing in the local newspaper online and in print, the team has been introduced to the city several times in the Gazette. Most recently, the three Liberators appeared on FOX21 weekend news. These Liberators also serve the community in various ways through speaking engagements, teaching organizing workshops, volunteering, and donating their time to those in need. Cathy, Leisa, and Michelle were born to organize and have a heart for busy families. Cathy has a Business degree and served in the ministry before joining Major Organizers. She received her Board Certification for Professional Organizers (CPO) in 2014. Leisa has two Masters degrees and also serves in the school system teaching in Special Education. Michelle has a degree in Speech Communications and earned a certificate in organizing and space planning before she aced the Major Mom Academy. She is an avid scrapbooker that has created hundreds of traditional and digital scrapbooks. All three are moms themselves and care deeply about the people around them. I love how wonderful my kitchen looks now. We were able to get so much done in the time she had. I am excited about hiring them again. My experience was awesome. I went from stressing, overwhelmed to ready to start my new life. She was very hands on, helpful and helped me to be able to maintain the major change. I am very grateful for the help. I would recommend Major Organizers to anyone that needs a little help without judgment. Cathy helped organize our business office and storage/conference room. She was friendly, fun and professional. She was curious and respectful of my needs and ideas. She was insightful and helped me help myself in getting organized. We have gotten many compliments on our office. My business partners and employees appreciate knowing where things are located and that the placement of items make sense. Love Cathy and what she brings to her job! Cathy was so helpful helping us organize our office and making it easier to use and maintain. She used techniques that made sense to us when using our space without her. Cathy is a life saver. My wife and I have argued numerous times about her clothes. Cathy was patient with my wife and organized her closet to fit my needs as well as her’s (Lisa). Cathy did more than just organized our closet. She relieved stress in our marriage by decluttering our closet. By showing my wife what was useful and useless made our life easier. Cathy Thompson with Major Organizers came to my home to set up a filing system, functional desk space and to put in place a playroom that functions as a working therapy center. Not only did Cathy transform my home, she transformed my life! I highly recommend Cathy to any business, organization or individual. She is top notch and a master at her trade! Thank you, Cathy! Allowing people into your life mess is terrifying. Cathy & Michelle were so kind and low-pressure that I felt so comfortable allowing them into my mess. My room was out of control and it was paralyzing for me to try to get it organized. Cathy & Michelle jumped in and really helped me evaluate the use of my space without making me feel like I had to give it all up. They are well worth the investment! I am sold on both the service and the process! I went into this with dread but shortly into the first hour I was motivated, had vision and wanted more. I also feel I learned so much and could tackle any room in my home on my own without feeling overwhelmed. Great service, integrity & hard friendly workers. This was an incredibly good experience for us. Cathy was helpful both with the mental and physical work and she is so friendly and outgoing, the hours just flew by! Our house was a whirlwind of chaos that she cleared up efficiently in a way that incorporated out personal habits & tendencies. We also felt she was non-judgmental about our mess and our lack of “Life Skills”. Cathy is a real “Dog Whisperer” when it comes to interactions with dogs. I live in a home with two dogs that are not always people friendly. Cathy was able to sooth the wild beast with her calm and friendly demeanor. I would highly recommend this service to any and all dog lovers. Super helpful, no judgment, super fast, efficient, so kind, professional, will use again. It was a great experience and the help made me feel so much better! Thank you! Great work! Without your help I would have died with all this crap! That would have been very bad for anyone left. Thank you very much. I would like to thank Cathy for helping me organize my closet. I had no idea where to start and she helped me accomplish all of the ideas I had, and also the ideas Cathy has to share with me. Again, Thank You. Having someone come and help focus my attention, reframe my thoughts on “zones” and “sorting like items: along with actually physically completing the tasks was like changing. Cathy is a miracle worker. My needs are very unique and my need for visual access was a constant road block to me. Cathy helped me break them and establish systems I can use years to come. Thank you to the ladies of Major Organizers. We can see our basement again, has not happened in 10 years! We appreciate all their hard work, tips on future projects and professionalism! Will have them back again soon. Wish we would have found them years ago. Would recommend them for all organization projects! Best money I’ve spent in years! Cathy was the best! Helpful, encouraging, organized, professional, and very good at what she does! She helped tame my chaos and my spaces are functional and neat. I would recommend Major Organizers to anyone! Cathy was an inspiration! It was clear to see that she is a hard worker and very creative. The synergy she helped create was motivating and uplifting. My wife and I would have taken weeks to do what she helped us to do in just a few hours. The ideas she provided were excellent and she even gave us homework to help us improve our space! Cathy is awesome! Listens to my needs and accommodates them efficiently, quickly and professionally. Exceeded my expectations. Definitely recommend Major Organizers and will use again as needed. Cathy is well organized, quick, easy to communicate concerns to and she has a solution almost immediately. Without Cathy’s superb organizational skills, my condo would still be boxes! I HIGHLY recommend Cathy and she goes the extra mile to accommodate her clients. I am very satisfied and will utilize Cathy again and recommend her to everyone. This was an amazing experience for me. The two ladies who came to organize me were so very smart and fun to work with. It was difficult for me to go through all of this stuff, both emotionally and physically. I tried to give them carte Blanche and they took it. They just did so much for me and after sorting and giving away so much they helped me see how pleasurable it could be to know that someone shopping at “Goodwill” wood enjoy my donations. My experience was quite amazing. Cathy helped me get movin on my want for my home. She walked me thru on an easy to follow plan and was very patient and kind thru the process. In the short time frame we had to get it ready to show, it has been a weight lifted from me. She has made me more than ready to fine tune on my own. I enjoy it so much. I might rethink moving! I was hesitant in hiring someone else to come into my crazy clutter, but I needed the help desperately. I’m so glad that I did!! It was the best experience! The process was truly great. They were so professional and helpful. We had fun while going through a million boxes. They were able to help me make difficult decisions on items I wasn’t sure if I wanted to keep. I would defiantly hire them again and recommend them to others. My ten year-year-old’s room was a disorganized mess! It was too overwhelming to come up with storage solutions and organization on our own. Cathy made look easy! I enjoyed participating, yet being guided along. I learned some great tips to use elsewhere in my home. We are confident we can keep it wonderfully. To start on this project was overwhelming but Cathy came in and on thing at a time we got through it. She is amazing at her job no matter how I felt she always encouraged me that any progress was good. Now I can use this space and I feel accomplished at thanks to Cathy and Major Organizers!! It’s absolutely awesome! I contacted Major Organizers after years of feeling overwhelmed by paper clutter. I needed help organizing my home office space. Cathy was WONDERFUL! She was very professional but also connected with me on a personal level. Upon arrival she took time to truly listen to the challenges that led me to ask for help. She didn’t come in with a set plan for change but instead recognized the uniqueness of our family situation (having a child with special needs) and customized my office space accordingly. Cathy offered suggestions but always requested confirmation that her proposed plan was acceptable to me and would ultimately work for our family. She helped me to set up a filing system that has been super easy to maintain. Cathy left me feeling motivated and excited about organizing other areas of our home. It truly was a liberating experience! Money well spent! Thank you, Cathy! Cindy and Cathy were great! Very friendly and efficient. I feel they went above and beyond to make sure I liked everything. Loved my experience! My office was a jumbled mess! Cathy arrived to save the day. She not only helped me organize the space but she helped teach me how to use the space, what to keep, what to shred or toss, and when. She was inspiring with her disciplined approach to helping me solve my problem. Money well spent! Cathy was exceptional! She really helped me stay on task – which is important because I have ADHD. She listened to my vision and helped make our home work with our energy. Thank you a million times. I will definitely recommend Major Mom to all my friends and family in addition to using them again for the rest of my home. I just want to take a minute to express my sincere appreciate to Cathy and Saundra for their help in getting my spare room unpacked and organized. They have an amazing work ethic and pleasant personality. They were very professional and understanding when it came to my deciding what went to which pile. I would recommend them to anyone. The service was outstanding. Both girls (Cathy and Jessica) were the best of the best. Both me and my wife are extremely happy with the service and feel in our case it was a life saver. Would recommend to anyone. Thank you, thank you. I chose to call Major Mom because I knew I would need help staying focused and on task with one project area at a time. Cathy and I worked well together to sort through items easily and put things in categories for storage and easy access. I am thrilled that my basement storage is finally organized and has a system! Cathy did an excellent job pulling it all together and was a joy to work with. I look forward to calling Major Mom for future projects. I am so overwhelmed by my two storage bins that I knew I needed extra help and support to go through so many household items. Cathy and I clicked right away and worked fast, organized and it was positive. I did not cry once through the whole experience! I called in order to jumpstart my home organizing before moving. Cathy was awesome and gave me the direction I needed! I was overwhelmed before and she knocked out the trouble spots! Colorado Springs, CO. Military member.